Wow! We are getting lots of folks interested in this swap. Very cool. I have also been getting requests for a few more details. Sorry not to have posted this info sooner. I am very new at swapping and have never hosted before! Children's Book Guidelines: Please go for something vintage, in decent condition for it's age. I personally do love to find children's names scribbled on a page or two, or an old bookplate in the front, so I think that would be okay. But please try to avoid books with coloring on every page and several pages torn/ missing. I think anything published prior to 1975 should qualify as vintage. Try to keep the price you pay for your vintage book between $15-$20. If you can get a few books for $15-20, great!!! Antique stores, eBay, and flea markets are wonderful places to find vintage books. Picture books, chapter books, all will work as long as they were written for children-teens. 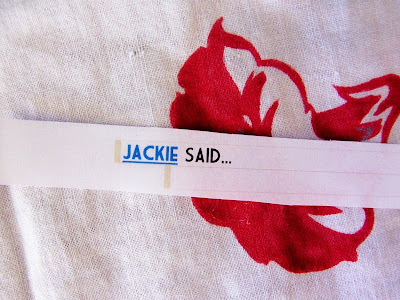 Crafty Bookmark : Anything you create or purchase from an artist who handmade the bookmark goes! I have seen crocheted and knitted bookmarks, clay bookmarks, altered art paper and collaged bookmarks. the possibilities are endless! As mentioned, I'll take sign ups until September 2nd. On September 3rd I will match everyone up with 1 partner and notify everyone of their partners' name. Participants can then email each other their respective addresses. It would be wonderful if everyone could mail out their goodies by September 16th. I hope that's helpful. Please let me know if you can think of any other questions :-) And thanks for your patience with a newbie like me!!!! Just got back from a quick weekend trip that Mr. Polka Dot Pixie and I took to sunny ( and warm) Southern California. We braved the intense heat and sun for a fun filled treasure hunt at the famous Rose Bowl Flea Market in Pasadena. I scored lots of lovely things that I'll be posting pics soon. In the meanwhile here's the blog banner, as promised. I'll get in touch with all participants by September 3rd. Hope everyone had a beautiful weekend! Hooray!!!! !I am so happy that many of you are interested in doing the Vintage Storybook and Crafty Bookmark Swap mentioned in the last post!!! Since everyone is so busy and so many bloggers are taking breaks till Summer's end, I am thinking that September 1 would make a good deadline for sign ups, and September 15 would be our deadline to do our exchanges. The day after the deadline, I will contact everyone with their swap partner's info. This is my first time hosting a swap, so I hope that timeline works out for everyone o.k. ??? 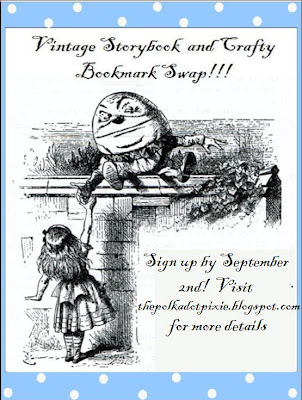 This Sunday night, I will post a swap banner with all of the pertinent information that you can copy and paste on your blog if you want to recruit more swappers! I'll be posting sporadically this month due so that I can get my stock ready for the Cottage Boutique show next month. 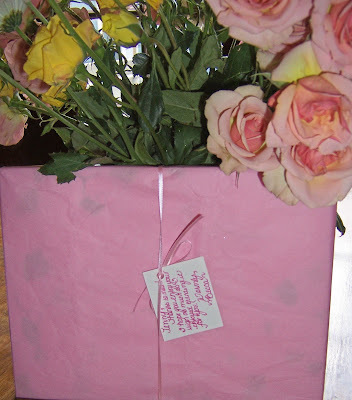 The giveway winner, a swell swap idea and some lovely mail goodness! Thanks everyone who entered the giveaway. If you have a blog, I promise I will visit it soon to say thanks "in person". Since so many seem to share a love of books, I was wondering how many of you would be interested in participating in a Vintage Children's book and handmade bookmark swap??? Participants would scour their favorite haunts for a richly illustrated old children's book, and then create crafty little handmade bookmark (any medium, paper, fabric, etc...) to accompany the book. Anyone in??? ?If I can get a show of hands, I'd love to play host! 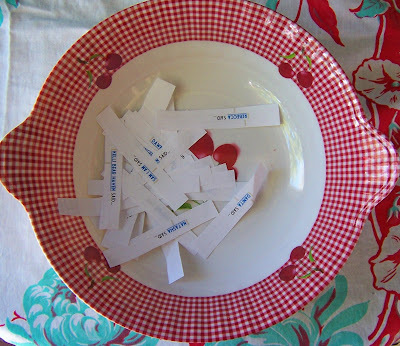 Okay, so how cute is the bowl I used for the name drawing?!?!?!?!?! 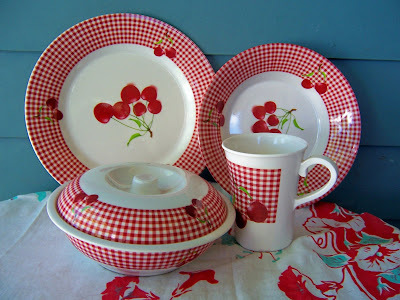 ?These adorable vintage-y looking cherry bowls, plates, and cups came courtesy of the lovely Rebecca of Thrifty Goodness. Even my husband loves them! Thanks so much Rebecca, I promise a package of goodies are heading your way very soon!!!! 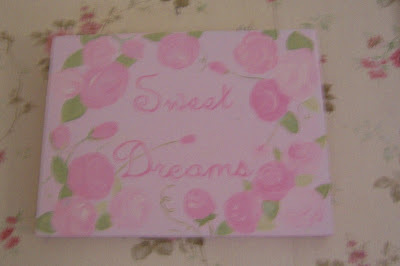 I absolutely love the beautiful Sweet Dreams sign, hand painted by the talented Becca. It's happily hanging in my bedroom! Many many thanks to you! You are blessed with tons of talent!!! Also in my bedroom, these wonderful finds purchased from Phyllis of Shabby in the City during her Flea Market Friday. 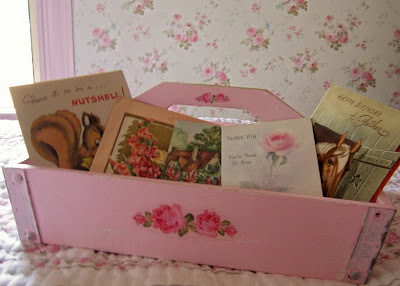 The vintage cards you see in the tray were included as an extra gift from the sweet Phyllis. I can't begin to describe how much your thoughtfulness lifted my spirit when the package arrived! Thank you so much Phyllis!!! 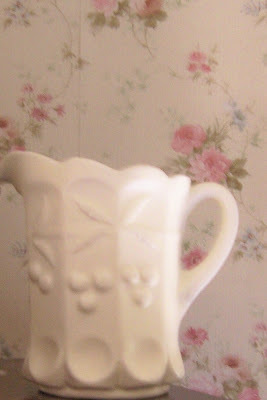 Okay, so who wants to come over to my house and have lemonade from this pitcher and yummy little tea sandwiches set up on those cute cherry plates?????!!!! Finally, be sure to leave a comment or send me an email if you think you may want to do the book swap thing. If enough people are interested, I'll set it up and post all the details next week.